I confess that I cannot stand when a man doesn't let a woman on the elevator first. work in my office building. For real. I'm loving that I'm happy the weather has been nicer but I honestly dread the heat and humidity. As an asthmatic, the heat and humidity bother me more than the cold. I like to believe it's the old myth that people born in the winter months prefer the cold. I confess that I love walking through the Boston Public Gardens to see all the pretty flowers. However, they make my allergies go crazy. I should just stay away but it's just so damn pretty. I'm loving this season of Southern Charm. My favorite cast member is Patricia Atschul, mom of Whitney Sulder-Smith. Have you seen her home?? TO DIE FOR. To see more of her home, click here. 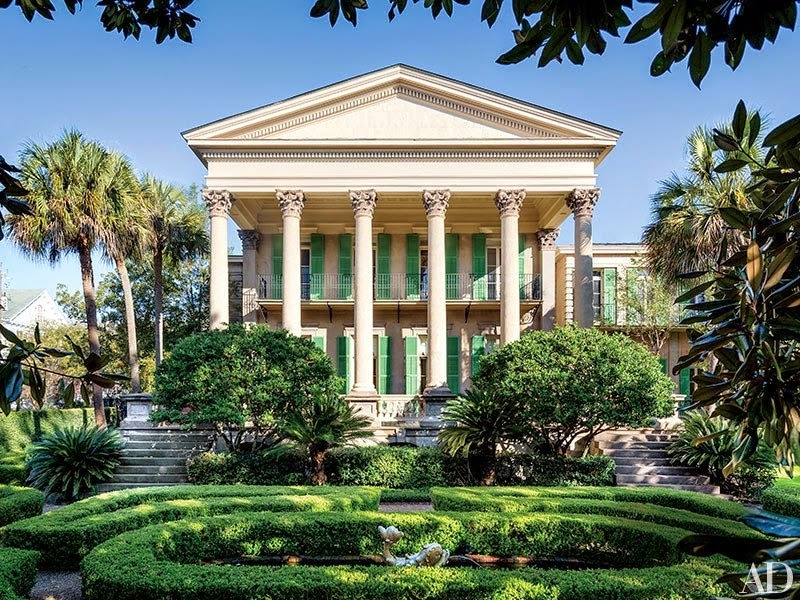 Totally adding Charleston, SC on my bucket list. I confess that my shopping ban isn't going well at all. I bought another wallet. Like I needed another wallet but it was pink. I so need to get a grip. I'm telling you anytime I see the color pink, I just go crazy. 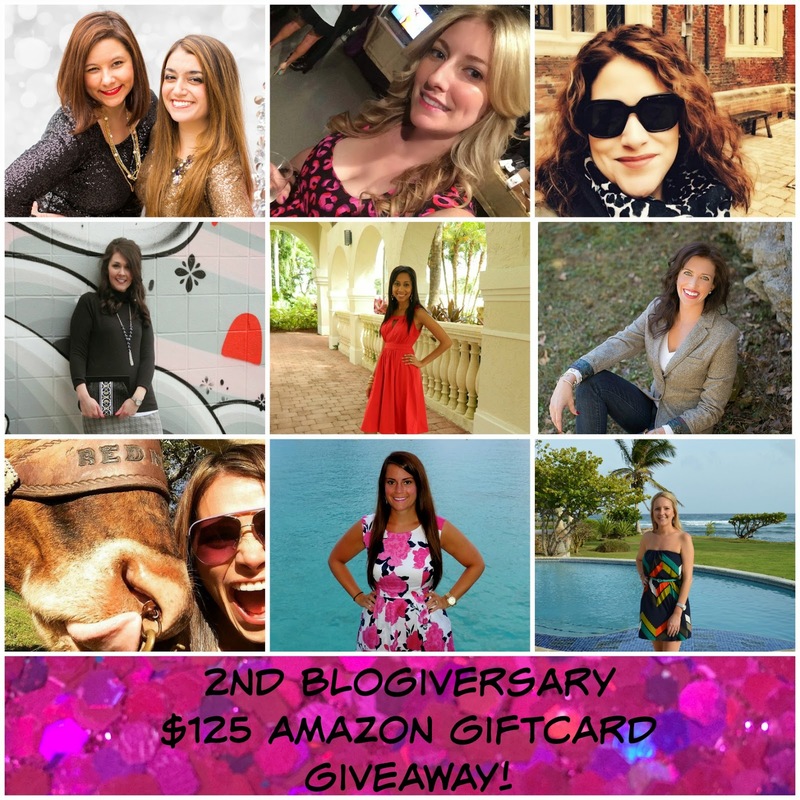 For the next week, I am teaming up with a fabulous group of bloggers to give away a $125 Amazon gift card to celebrate The Sequin Notebook's 2nd Blogiversary! Enter via the Rafflecopter below and be sure to give all of these gals some love by following each of their links - after all, every link is one entry closer to winning! The giveaway will run from now until midnight on May 12th - good luck gals! 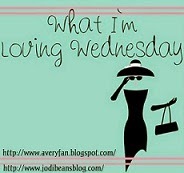 I haven't seen that shown but I love all things Southern. It just seems more charming and nice. The flowers are pretty but I feel for people with allergies. I've never heard of that show. . . I'm so happy that the cherry blossoms and flowers are finally in bloom. So pretty! Sorry it bothers your asthma!! Mree, I totally agree about men that don't have manners. I ride the NYC subway every day and when a man gives up his seat for a lady, old person or child I am so impressed. It happens so rarely that is shocking. If you want to impress ladies in NYC - give up your seat on the subway. That is a fact. Also, there are no such thing as too many wallets - especially pink ones! I'm so with you on that - how rude when guys just don't have manners! those cherry blossoms are just amazing!! So with you on the humidity. I love the warmth and I'm so glad it finally feels like spring here in NJ, but I just know it's a matter of time before it's like 90% humidity every day! I just bought a pair of sunglasses. I need those like I need a hole in the head. I'd trade a man opening a door for me or letting me into an elevator first for equal pay any day of the week. I detest humidity and excessive heat. Ohhhhh I want details on this new wallet! Oh girl I can't tell you the rage I have when a man walks in front of me or doesn't open the door. Like hello are manners just totally dead? OMG YES to Southern Charm this season and Patricia. Totally loving her, she's so ridiculous in the most fabulous way possible! Well a few weeks ago, a guy sitting next to me on the train was biting his nails and making sucking noises..OK EEWWW. Zero manners. Errmm.... I just commented but it got deleted?? Main points- I want to see this fabulous wallet too! And I'm a December baby and summer is my favorite season, but I'm not asthmatic, so that may have something to do with it? i feel ya on the lack of manners--why did this disappear?? Manners are so not a thing for people anymore and it is a shame!!!! And dont get me started on heat and humidity!!! Try living it up down here in the deep south! I'm so with you about guys needing to be a gentleman and letting a lady go first (or hold a door for her).